If you are keen on watching the sky you might notice that it puts on a special show only on a few days. The fact was specially prominent to me while I watched that special sunset at Udaipur. Maybe as I am commuting most of the days at sunset I simply do not notice the drama on the weekdays. Whenever I have sat in peace at a sunset I have always liked it.On my recent trips two places stand out for sunsets, Maldives and Udaipur. 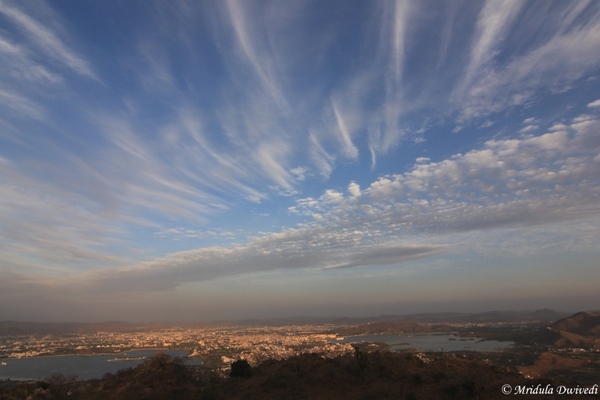 So for today’s Sky Watch, Udaipur it is. At Maafushi, Maldives every evening was special. At Udaipur I had just one evening but the sky put such a drama! Have you ever noticed that if there are a bit of clouds in the sky the sunset usually is more spectacular? I have nothing against plain sky sunsets but when I saw the clouds around sunset time I let my hopes sore. 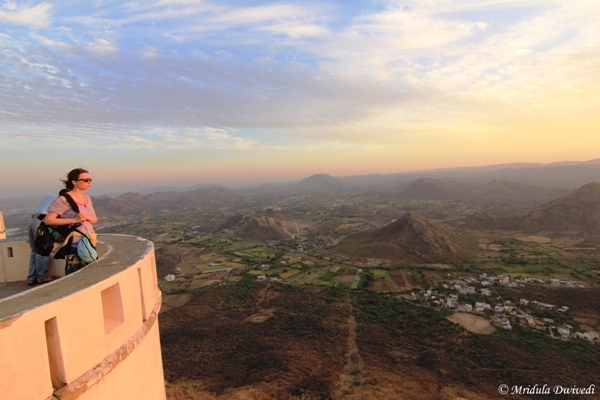 Monsoon Palace is a beautiful place for watching sunsets. If you are in Udaipur do go there for sunset. There are two levels at the Monsoon palace. As I climbed the dimly lit stairways to the second level, my reward was a view of the balcony below along with the spectacular view. After a particular time the house keeper of the palace starts telling everyone to get out or they would get locked in. I remained long enough to hear that warning. Being locked in was not my idea of fun, not alone at any cost. I was also not sure if the resident ghosts use it for their affairs after everyone is gone! Finally the sun decided it has enough of the world and retired in a quiet corner. For me too it was time to head to the car park and go back to my hotel. PS. This post is part of the awesome Skywatch Friday theme. There is something magical about sunsets and sunrises. 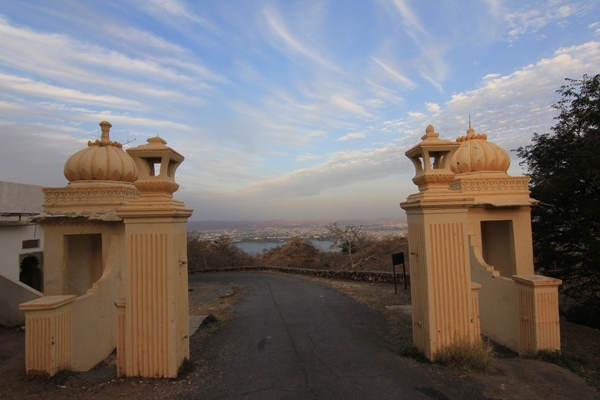 The point was driven home when I went to the Monsoon Palace at Udaipur. 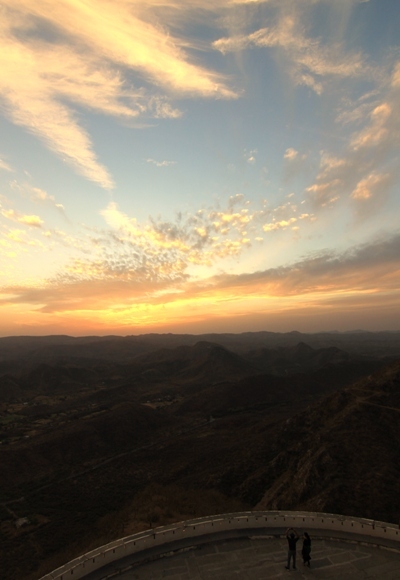 And the Udaipur sunset was amazing. A lot of sunrises I just sleep through. Have you noticed that many people seem to be oblivious to the beauty of the sunsets and the sunrises. I used to be one of them till I discovered Skywatch Friday a few years ago. I was actually one of those people who could just walk through some of the most amazing skies virtually unmoved. I am glad it is a thing of past now. I recently visited the Monsoon Palace, Udaipur. It is the place to be at sunset in Udaipur. The view of the city is gorgeous as well. 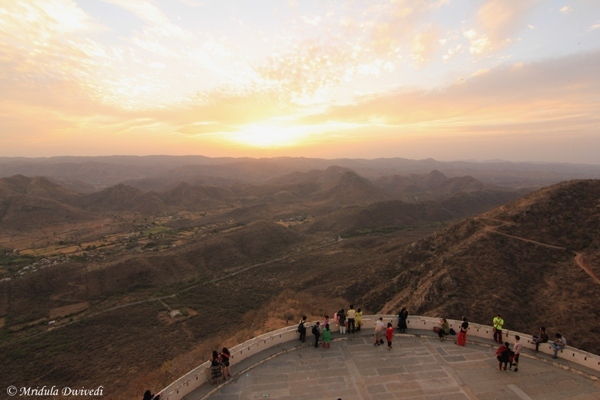 I am told that the view from the Karni Mata temple is also worth checking out but that is on my agenda for the next time. Have you been out on sunsets when the sky decides to go quiet on you? I can’t count the number of times it has happened to me. So, now when I go to watch sunsets I keep my expectations low. Thankfully this time when I was there the sky was in a party mood and it put up a good show. The Monsoon Palace, Udaipur was formerly known as the Sajjan Garh Palace after Maharana Sajjan Singh who got it constructed around 1884. 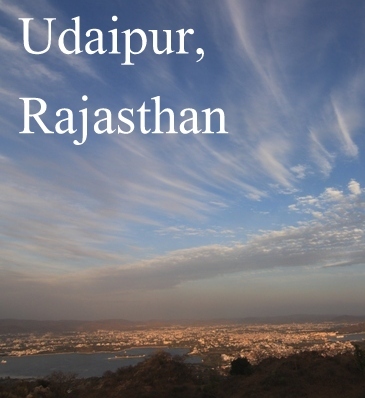 As of now it is managed by the Forest Department of Rajasthan. It is open to public till sunset. It offers a stunning view of the city lakes, the city itself and the hills. 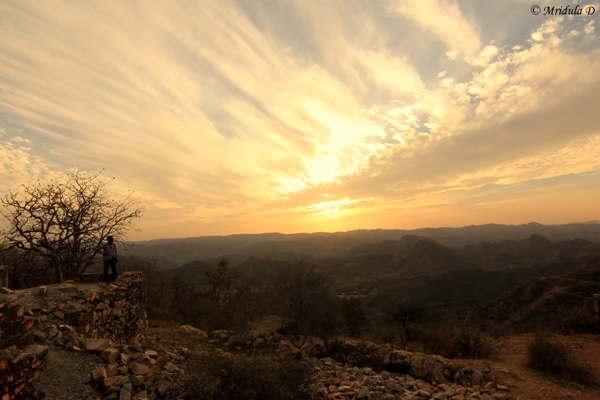 It is a popular spot with the tourists to watch the sunset. After spending an eternity clicking the view of the city, I finally walked inside the palace and went to the balcony to see the sunset. I then climbed up a flight of stairs too to see the view. All around it was gorgeous. 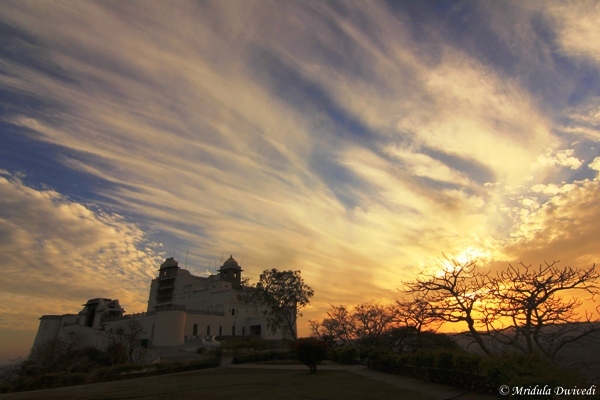 If you are in Udaipur, I will highly recommend visiting the Monsoon Palace at Sunset. It all depends on the nature’s mood on what kind of show it will put, but it is certainly worth a try. The palace is faraway from the entrance gate so it would be easier for you to go there in a vehicle. I was revisiting Udaipur after 14 long years. And this time I was spending even less time in the city. I had one evening to be precise. I was invited by the Rajputana, a Justa Group Resort. The good folks were willing to host me for longer. It was I who had no leaves left in March other than the Friday I managed to club with the weekend. How I wish I had one more day! 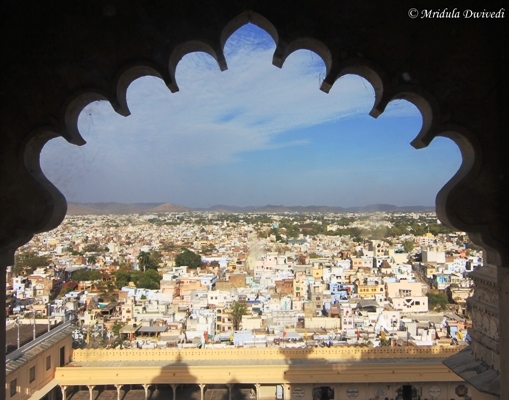 At Udaipur I spent some time at the City Palace and the Monsoon Palace. I am sure I have missed out on a thousand things but just these two made for such a memorable evening. I did a rushed tour of the city palace, you guessed it, due to lack of time. But even then there were places which would make me stop dead in the track. This view of the city for the kings and queens was one such spot. I was moving around the city palace like a woman possessed as I had only one and a half hours to spend before it would close for the evening. I realized how big the place was when I tried to cover it all in that short span of time. Still this warrior made me pause again for the rich details in the painting! They made things to last for a really long time in those days! 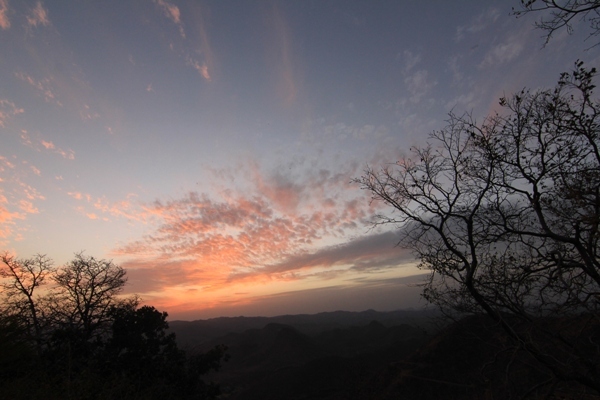 When I reached the Monsoon Palace the sky was already in a benign mood. 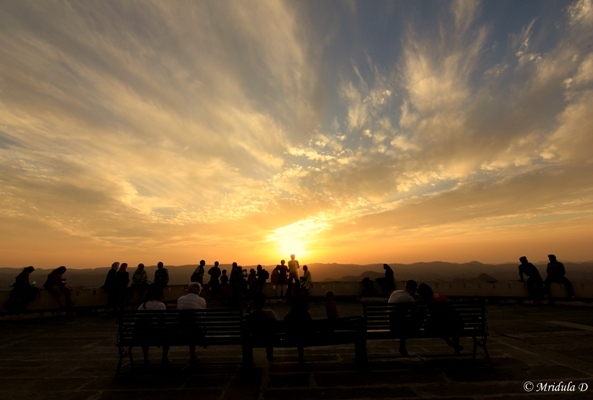 The palace offers excellent opportunity to watch the sunset over the city with panoramic views all around. 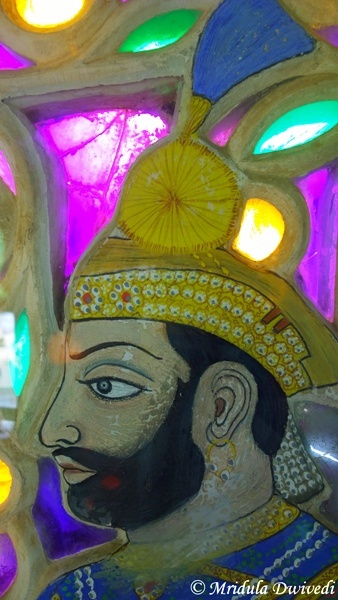 I had missed it when I visited Udaipur in the year 2000. I highly recommend this place for its views of the city. The palace has not much to offer in itself but the views are to die for. As it was March, the flowers were in full bloom. There were other visitors too but not so many that we got on each-other’s toes. In fact I asked a few of them to click my pictures too. Kunal, my host from the hotel, and I were discussing later that school books conveyed such a typical picture of Rajasthan! I for sure thought that it was all desert till I visited it for the first time in 1990! Greenery and hills are so contrary to the typical notion of desert and yet this is Udaipur, Rajasthan. 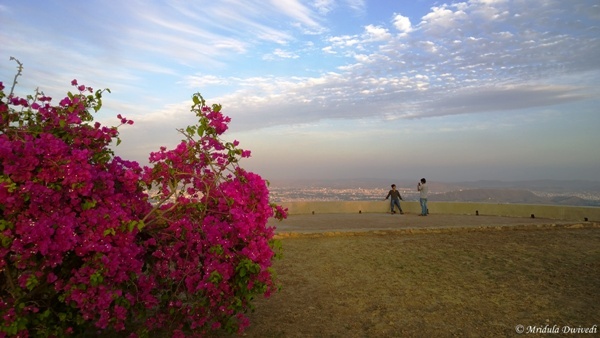 This is one of the views you get of the city from the Monsoon Palace. If I am not mistaken the lakes are Pichola and Fateh Sagar. The drama in the sky provided the icing on the cake. I tore away myself from this spot with a lot of difficulty. I was one of the last persons to leave the balcony, so mesmerized I was with the view. It is a pity that I had just a few hours in the beautiful city of Udaipur but on this occasion they were enough.